So many desserts are overly complicated. Sometimes you just want a simple dessert, with minimal ingredients, that’s super easy to make. 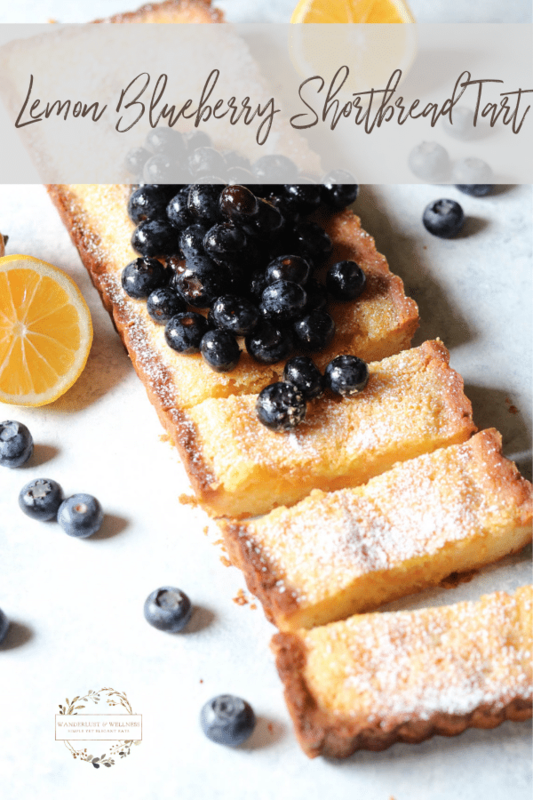 This easy lemon blueberry shortbread tart looks gorgeous but is super easy to make! It’s perfect for your next Sunday brunch!
. It’s non-stick plus has the removable bottom, which makes transferring your tart from pan to serving platter super easy. I’ve done gluten-free tarts before using a gluten-free pie crust recipe, but for this shortbread crust, I stuck with traditional ingredients. If you need gluten-free, I know there are some GF shortbread crusts out there on the web, and who knows, maybe I’ll create a GF version next time just to experiment! The lemon filling combined with the shortbread crust almost makes these more like gooey lemon bars that a traditional custard-like tart but they were so moist and delicious. I added fresh blueberries to the top and sprinkled with a little powdered sugar. I may or may not have devoured these within a week’s time. Oops! 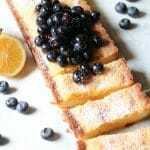 Enjoy these additional shortbread desserts, too! 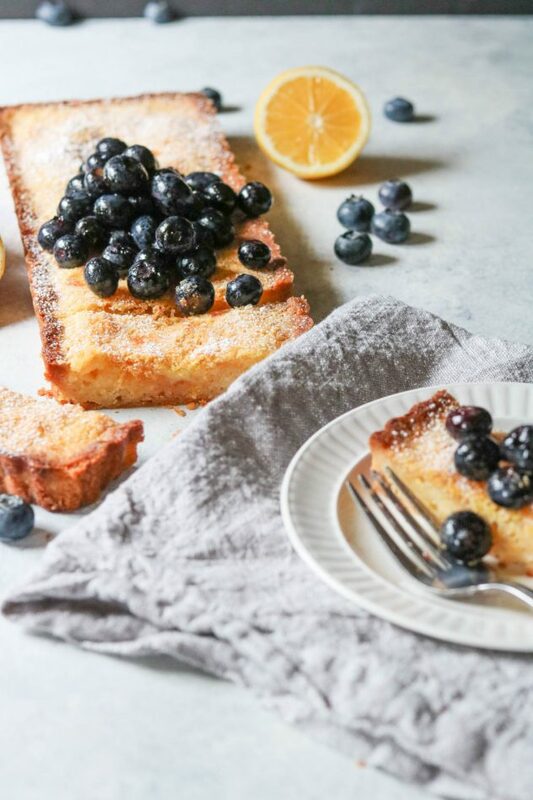 This lemon blueberry shortbread tart is ooey soft, just like your favorite lemon bars. Preheat oven to 425 degrees F. Grease your tart pan with coconut oil or butter. In a food processor, add flour, sugar, and salt. Pulse to combine. Add in the cold butter one small chunk at a time. Continue to pulse until the dough starts to come together in clumps. Remove the dough from the food processor and press into your tart pan using your hands. Smooth out the bottom and make sure it’s even. Press the dough up the sides of the tart pan. Using a fork, pierce the bottom of the crust multiple times throughout the pan. This will help prevent the crust from rising too much during baking. Cover the dough and place in the freezer for 15 minutes. Place the tart pan into the preheated oven and bake for 13-15 minutes or until golden brown. Remove from oven and place onto a cooling rack to cool. While the crust is cooling, whisk together the eggs, sugar, lemon juice, and lemon zest. Place the tart pan with the cooled crust onto a baking sheet to prevent spillage and pour the filling mixture into cooled crust. Place the baking sheet into the oven and bake for 25-30 minutes or until the center is almost set. Remove tart from oven and transfer to a cooling rack. 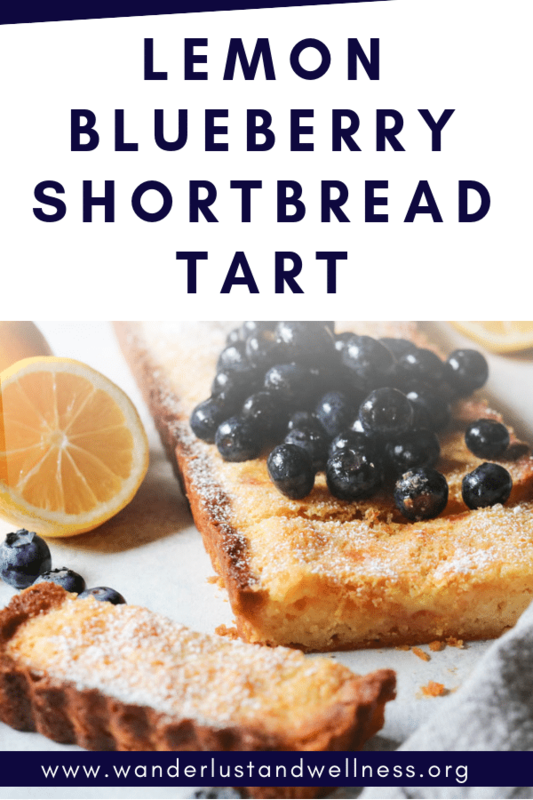 Once cooled, carefully remove the tart from pan, sprinkle with powdered sugar, top with fresh blueberries and serve. Hi Pam! Is the whole crust burning or just the edges? You could try covering the edges with foil. Or, you could also press foil into the actual tart pan, covering both the bottom and the edges, then remove for the last 5-10 minutes. Let me know if either of those options helps! 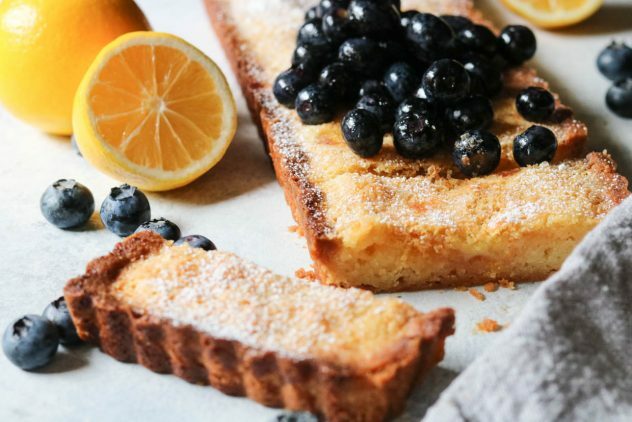 Thank you for your reply, the crust burnt…I baked with tart mixture in the pan, rest of tart was very good, but had to cut off the burnt crust.., should I have semi baked, the tart first then added the lemon curd and reduced the heat to 300° F, to set the curd? Hmm, I’m sorry that’s happening for you. I’ve never had it burn like that on me. You could definitely try semi-baking it first, then adding the curd and finishing it from there. I wouldn’t go lower than 350 degrees. The crust may end up a little soggier on the bottom, but you could try that. Or, I would try covering the entire crust with foil as it bakes. Unless you’re referring to the bottom burning. In that case try placing the tart pan onto a baking sheet, which will put a buffer between the bottom of the pan and the direct heat from the oven.